Well everyone the 2012 political season is finally over. There was a lot of humor in this years 2012 political season one of the best things that came from the political season was Obama and Obama’s anger translator played by Jordan Peele and Keegan-Michael Key. Now Jordan Peele and Keegan-Michael Key are former castmembers of MADTv. In 2003, Peele joined the cast of MADtv for its ninth season. Around the time Keegan-Michael Key joined the cast as a featured performer, it was assumed that Key would be chosen over Peele.Peele performed various celebrity impersonations, which included favorites Caroll Spinney (as the voice of Big Bird), Ja Rule, James Brown, Flavor Flav, Justin Guarini, Montel Williams, Morgan Freeman, and Forest Whitaker. Peele was absent for unknown reasons from the first 4 episodes of his second season on MADtv. He made a cameo in “Weird Al” Yankovic’s video – “White & Nerdy” with fellow MADtv co-star Keegan-Michael Key. There is also “Jovan Muskatelle”, a shirtless man with a jheri curl and a shower cap. He interrupts live news broadcasts by a reporter (always played by Ike Barinholtz), annoying him with rapid fire accounts of events that have happened frequently exclaiming “It was crazy as hell!” And in their new comedy series called key and peele on comedy central it is an American sketch comedy television show. It stars Keegan-Michael Key and Jordan Peele, both former cast members of MADtv.Each episode of the show consists of several pre-taped sketches starring the two actors that are introduced by Key and Peele in front of a live studio audience. And here is a review of Key And Peele by Hit Fix: Early in the premiere episode of Comedy Central’s new sketch comedy series “Key & Peele,” the show’s two stars, Keegan-Michael Key and Jordan Peele, talk about the challenges of of being biracial in 21st century America. “We find ourselves particularly adept at lying,” Key explains, “because on a daily basis we have to adjust our blackness.” This leads into a riff about all the people they sound whiter than — “We sound whiter than the black dude in a college a capella group!” Key laments — that’s very funny, and that also establishes a mission statement for the series (which debuts tonight at 10:30) beyond simply, “Here are two funny guys doing sketches and celebrity impressions.” There are sketches on the show that have little or nothing to do with race, but more often than not, the humor is informed by the intersection between what’s considered black culture, what’s considered white, and what a couple of light-skinned buddies who self-identify as nerds can get away with depending on the company they’re in. Comedy Central has tried a few of these sketch/stand-up hybrids over the last decade (I quite liked the short-lived “Important Things with Demetri Martin”), but the one “Key & Peele” will obviously be compared to is “Chappelle’s Show.” Before Dave Chappelle walked away from the show (and, for a good while, show business), he made a huge mark with comedy that was simultaneously blunt and thoughtful about race(*), and Peele recently described Chappelle as “a hero of ours” while describing the decision to mix the sketches in with segments where they talk to the studio audience. (*) I know everybody loves the Rick James episode, but I’m very fond of “I Know Black People,” a game show where Chappelle challenged various black-adjacent white people (a cop, a Korean grocery clerk, a writer on “Chappelle’s Show”) to answer questions about black culture, and Chappelle, John Mayer and ?uestlove trying to identify which musical instruments are most likely to make different racial groups dance. The humor in “Key & Peele” is gentler than “Chappelle’s Show” — the two stars come across as laid-back and genial when they’re talking in the studio — but no less keenly-observed. And, much of the time, it’s laugh-out-loud funny. It helps that the stage patter between Key and Peele is so strong. Where I remember very little of what Chappelle or Demetri Martin did and said in front of the studio audience on their respective shows, some of the best “Key & Peele” moments take place on that stage, whether it’s Key recreating his experience watching “Bridesmaids” on an airplane or the two friends acting out what it’s like when white people fight outside bars. The whole genre of “white people do it like this, and black people like this” humor got horribly played-out during the stand-up boom of the ’80s and early ’90s. (One of my most-quoted “Simpsons” gags is Homer watching one of these routines and cackling, “It’s true! We’re so lame!”) And, of course, those jokes always had an undercurrent of suspicion or confusion about another group. But Key and Peele straddle both cultures, and there’s a feeling in that bit, and most of the material they do, that they’re just as capable of behaving like the white frat guy outside the bar as they are at being the President’s anger translator. So we have two likable and funny guys and a lot of untapped material. That’s an excellent start. And here are some examples of President Obama, who has hired an “anger translator” named Luther (Key) to loudly rant about his various enemies: http://www.youtube.com/watch?v=-qv7k2_lc0M&feature=player_embedded and http://www.youtube.com/watch?v=eX8tL3PMj7o . Now to me I think this is a breath of fresh air because the political season has been a mess and to laugh in the middle of a election takes pressure off of everyone covering the elections. And now who covered the election the best. To me is ABC News because they break down the election in a way you can understand it. And they turned times square into the ultimate election headquarters. And the election studio was the best studio I have ever seen hands down because they put everything you need and want to cover in a election and put it all into one studio. Here is some more infomation on that: In the center floor of the studio is a large, high-resolution circular LED screen (a Barco NX4, if you’re looking for specifics). 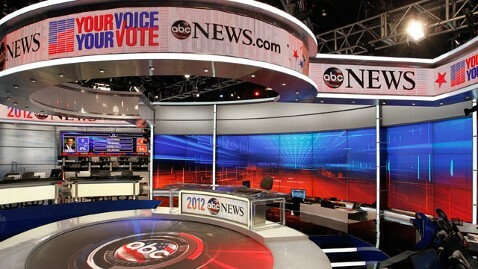 In the picture above, the ABC logo is shown on the display, but during broadcasts it will also show graphics, including polling data and maps. The screen, which you cannot stand on, has been covered with a fusion material to prevent glare. At the top of that circle sit the election night anchors — Diane Sawyer and George Stephanopoulos. It all makes for a pretty stunning visual when the camera pans out, which you can check out this clip below: http://abcnews.go.com/WNT/video/president-obama-mitt-romney-sprint-finish-17648114. “ABC News Your Voice, Your Vote – Election Night Coverage” will originate live from ABC News Election Headquarters in Times Square, where ABC News will once again transform the Crossroads of the World into an outdoor global viewing event, with real time election results appearing on several of Times Square’s iconic screens. And another thing about abc news is the power of yahoo news. Abc news and Yahoo news has a partnership where this partnership blends ABC News’ global newsgathering operation and unrivaled lineup of trusted anchors and reporters with Yahoo! News’ unmatched audience, depth and breadth of content. Under the agreement, ABC News becomes the premier news provider on Yahoo! News, with editorial teams from both organizations collaborating on original coverage to appear on both the Yahoo! News and ABC News sites. Teams will co-produce coverage for major news events and will have integrated bureaus in New York, Washington, D.C., and Los Angeles. ABC News content will be integrated throughout the Yahoo! News network, including the Yahoo! front page. ABC News will maintain editorial control over ABCNews.com and GoodMorningAmerica.com, and Yahoo! News will maintain editorial control of all its sites. And check out this fact:Election Night 2012 proved to be the most successful joint live video event in the history of the Yahoo!-ABC News Network, with combined traffic of nearly 10 million live video streams across ABCNews.com and mobile, the Yahoo! News’ Election Control Room, the YouTube Elections Hub and other partner sites. ABC News and Yahoo! produced over seven hours of live coverage hosted by GMA Weekend anchor, Dan Harris, ABC News Political Director Amy Walter, and Yahoo! News White House Correspondent Olivier Knox and featured the best talent of ABC News and Yahoo! News, as well as several new features and products that drove user engagement. “The Election season continues to show the combined editorial strength and reach of the ABC News – Yahoo! News partnership,” said Joe Ruffolo, Senior Vice President ABC News Digital. “It also highlights the focus of ABC News Digital as we continue to deliver the most engaging content and original video, innovative product experiences, and additional live streams to meet our user and advertiser needs.” Real time election results appeared on several of Times Square’s iconic screens including ABC’s Super Sign, the enormous digital façade of NASDAQ and the 23-story high Reuters sign. Throughout the night “Good Morning America” news anchor Josh Elliott was on Military Island talking to the crowds gathered, getting real-time reaction to the results. So all and all I think they did a fantastic, outstanding supercalifragilisticexpidocious job on covering the election of all elections. The ABC News-Yahoo! News live-stream is also available through Yahoo! News’ Election Control Room. The Control Room allows Yahoo! News users to create their own election dashboard where they can control content through maximizing and minimizing the features they care most about. A complete mobile app suite for iPhone, Android, and iPad will offers users real-time election results, interactive maps and info graphics in addition to the live-streamed video. ABC News mobile app users can choose to enable geo-targeted push alerts and real-time election results on their phones for an enhanced mobile experience. In addition, ABC News brings election coverage to the newly launched ABC News Windows 8 App, delivering Election Night updates and video clips to users and to the Bing News app for Windows 8. So You get a little bit of humor and and information this political season. Know what you do and do what you know .